Welcome back to DYSU for another round of fun! It's time for another challenge and this week we're asking you to Create A Landscape! So, get your thinking caps on, and lets see your interpretation of landscapes! 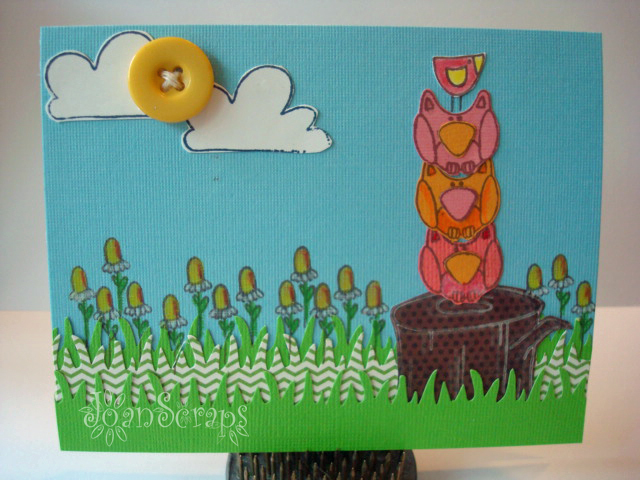 For this week card I used the Crazy Critters Stamp set fron TAWS. This is such a fun card Joan. Love the bird tower and the button sun. This is lovely Joan, so pretty and colourful. HAHA this is so cute, Joan. Love the grass, too! Super, stinkin' cute! LOVE your layered, grass patterns and that darling, button sun! Fab idea to mix solids and patterns for the grass. And the botton sun is fantastic! Love this!